(Nanowerk News) The development of DNA sensor systems is of great importance for advances in medical science. Now another piece of the puzzle for the development of personalized medicine has been found with the results of a highly sensitive monitoring of cancer-related topoisomerase II enzymes (Nucleic Acids Research, "Interlinked DNA nano-circles for measuring topoisomerase II activity at the level of single decatenation events"). Sensors and sensor systems made of DNA have gained increasing interest over the past several years. This is due in part to the recent advances in chemical synthesis of modified DNA oligonucleotides and to the ease by which DNA sensor systems can be combined with various DNA nanomaterials. Hence, various DNA sensors or sensor systems for the detection of small molecules, proteins, or even enzyme activities, based on optical or electrochemical readout, have been reported. Some of these have been successfully integrated with more complex nano-structures. Many of the sensors or sensor systems are built as relatively simple structures, exemplified by single- or double-stranded DNA structures. These advances provide completely new opportunities for research. 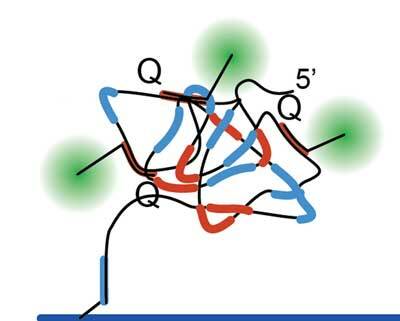 By the use of the DNA sensor system, researchers from Denmark and USA have demonstrated the assembly and utilization of a surface-attached double-stranded DNA catenane composed of two intact interlinked DNA nano-circles for specific and sensitive measurements of the life essential topoisomerase II (Topo II) enzyme activity. Human Topo II is of great importance in anti-cancer therapy and is the primary target of a large number of clinically used chemotherapeutics such as the drug etoposide. Unfortunately, a frequent side effect of treatment with these drugs is the development of resistance or secondary cancers. The available evidence suggests a potential correlation between Topo II expression and drug response, at least in some cancers. Sensor systems for measuring Topo II activity directly in human cancers may be of great value for elucidating a potential correlation between Topo II activity and chemo-response. The researchers succeeded in obtaining quantitative detection of purified Topo II as well as Topo II in human cell extracts consisting of approximately five to 5000 cells. By combining two DNA sensor systems, the Danish-American research team was able to achieve synchronous detection of both Topo II and Topo I, the latter being an important target for cancer treatment. As the Topo II activity is considered to be a predictive marker in cancer therapy, the described highly sensitive monitoring of Topo II activities can be an important piece of the puzzle for the development of personalized medicine and individualized treatment, where decisions are often based on sparse samples.